Have you ever wondered how much it would cost to have your favorite musician perform live for you? 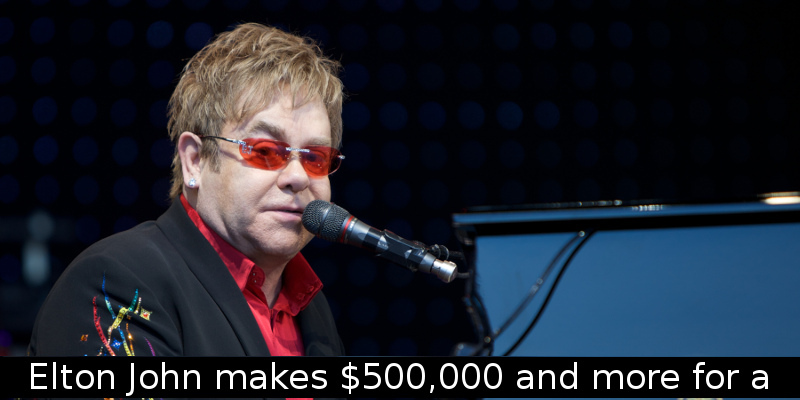 Well, if Elton John is among your favorites, then you’ll have to pay half a million dollars in order to book him for a show. 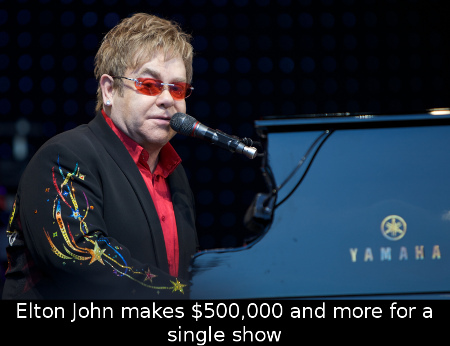 Sir Elton John is one of the most successful and pricy performers operating today. He’s performing in Vegas until April and reportedly makes at least $500,000 per show. The British musician gets 88% of ticket sales, which vary between $55 for ordinary fans and $1,000 for VIP fans. Not only is he making half a million from a single show, but he’s even more successful than America’s pop princess Britney Spears. Britney is also performing in Vegas, but she’s only getting $475,000 for her turn. Not only that, but according to TMZ, Spears’ venue hosts more people than Elton John’s. The reports claim that Planet Hollywood (Spears’ venue) hosts 4,600 seats, while Elton John’s one (The Colosseum) has a total of 4,294 seats. By the looks of it, the 67 year old British musician won’t be having any struggles when it comes to making a living and taking care of his family any time soon.